The newest accessory for tech maker IPEVO's best-selling line of USB document cameras is the Scan Kit, a scanning station which promises faster and more convenient document capture. The Scan Kit's vertical mounting surface speeds up the document capture process and reduces or eliminates camera shadow and glare. The Scan Kit is our answer to all those educators and businesspeople in need of faster and more convenient document capture. IPEVO, a maker and designer of technology products for education and business, continues to add to an expansive list of accessories for the company's best-selling USB document cameras. These cameras, favored by educators for high-quality real-time video capture of documents, can now be paired with the new Scan Kit. The Scan Kit mounts documents in an upright fashion so they are easier to capture and swap. 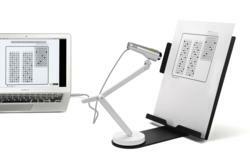 The Scan Kit is compatible with three IPEVO USB document cameras: the Point 2 View, Ziggi, and Ziggi-HD. The accessory offers a flat, upright surface at an ideal viewing angle, simplifying and facilitating the capture of standard-sized A4 documents. These documents can be mounted and quickly swapped for teaching sessions, business meetings and more. And like IPEVO's line of doc cams, which are known for their light weight and compact construction, the Scan Kit is portable and can be collapsed flat for travel and storage. In addition to standard-sized documents, the Scan Kit helps capture smaller objects like business cards, index cards, receipts and smartphones. This is accomplished through a magnetic paper stop in the middle of the mounting surface. And thanks to a bottom lip, books and electronic devices like the iPad can also be mounted and secured in place. "Our customers love the versatility offered by each of our doc cams, and they wanted a way to make the act of capturing documents even faster," said Royce Hong, CEO and big head of design of IPEVO. "The Scan Kit is our answer to all those educators and businesspeople in need of faster and more convenient document capture. The camera does not have to be angled downward, which saves time especially when multiple documents are involved. We think of it as a portable scanning station. Whatever you would like to scan, from artwork to test papers to receipts, the Scan Kit helps you capture it better and easier than before." Ease of use and speed are not the only advantages of the Scan Kit. The mounting angle also helps to eliminate both camera shadow (from the camera body) and glare, which comes into play for objects with glass screens like iPads. IPEVO is also stressing the Scan Kit's use in text enlargement for the visually impaired and others. Small text from a mounted physical document can be "blown up" onto the computer screen for easier reading using the doc cam and Scan Kit. This could potentially reduce eye strain and eye fatigue as well. The Scan Kit for USB Document Cameras is now available at the IPEVO Online Store at http://www.ipevo.com. Note that this is an accessory for one of three IPEVO USB Document Cameras, which are sold separately and also available at the company's online store.